Try this simple, delicious and nutritious homemade vegetable soup for the chilliest autumn days. 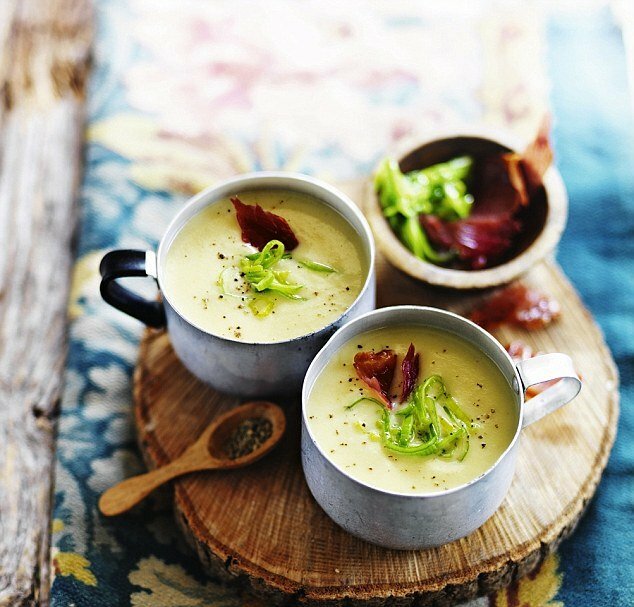 Creamy leek and potato soup with crispy pancetta (4 serves). clean pan and stir in the cream and milk. For the topping, finely shred the green part of the leek and melt the butter in a pan. When the butter is hot, gently cook the leek in it for a few minutes until softened. Place the pancetta under a medium grill and cook until crisp. Transfer onto kitchen paper. Reheat the soup to a gentle simmer (add some extra stock if it’s too thick), then pour into warmed bowls. To serve, top with a little pile of the green leek and broken pieces of pancetta.